Cars have grown to play a vital roles in our lives, so it’s only right that they have their own space in your home. In fact, its’s hard to find a single home, that was built within the last few decades, that doesn’t have a garage. These days, homeowners even use their garages as the primary entrance to their house and even install garage parking aids to assist with parking in tight garages. During the last decade, architects and garage door manufactures have begun to improve the designs of garage doors in order to improve curb appeal. Some of these new options can be fairly pricey but, thankfully, there are also a number of affordable and attractive garage door options for you to choose from. There are a wide range of residential garage doors that available on the market; e.g. there are those that fold, slide, roll-up, and go up-and-over their frames; this is just to name a few. In the United States, the most common type of garage door is the sectional door. These are the ones with horizontal panes that are fitted with rollers and hinged together. They can be operated manually or with the use of a motorized garage door opener. In addition, sectional doors are available with or without windows and offer many decorative styles to choose from. Another type of the garage door is the swing-style door. They open up like a pair of big French doors and are usually made out of wood. These types of doors are quite attractive mainly due to having strong vertical lines that help blend the garage with the rest of the house and they are also more energy efficient. Unfortunately, swing-style doors also require more clearance; they cannot be opened if you park too close to them. In addition, swing-style doors tend to take more time to be opened manually and locked. They are also more expensive to automate. Almost all garage doors are be made from vinyl, steel, or wood. They all offer their own advantages and disadvantages so keep reading to find out which one will suit you the best. Admittedly, vinyl garage doors offer the most benefits and are by far the most popular. However, it is important to note that due to some of them being unattractive, they can be a bad choice for some. Because of their light weight, installing a garage door opener is the easiest with this type. When purchasing steel garage doors, you must consider the thickness of the steel. This is a huge indicator of its overall quality. High quality doors are usually made with 24-gauge steel. It is important to note that the higher the number of the gauge, the thinner the steel. Quality steel doors come with long warranties; a typical warranty last about ten years. Can be painted albeit with special primers or paints. A wood garage door can provide beautiful curb appeal if used somewhere where it isn’t a recipient of direct sunlight and where it can be sheltered against the elements by an overhang against precipitation. In addition, it is important to note that, a roll-up wood garage door is better than a tilt-up model. Tilt-up garage doors may save you some money, but they are also heavy and can be difficult to operate. If you are interested in a composite wood door, you must stick to leading manufactures. 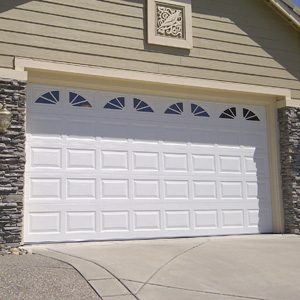 Off-brand, low cost garage doors are usually poor quality and can lead to many garage door issues. Composite wood doors are affordable and are meant to be painted.